We have enjoyed good success at the famous Warrnambool May carnival over the years and that looks set to continue with a very nice group of horses due to contest six races over the three days. Kicking off the action for Ballymore are the stayers Araldo Junior and Extra Noble who take each other on in the City Of Warrnambool Handicap on Tuesday. Drawn nicely in barrier four for Mark Zahra, Araldo Junior is yet to be tried on significantly rain affected going but Michael Moroney has always had the feeling that it would suit the imported galloper. "He probably wants further but those conditions bring him further into calculations," he said, adding that he is looking forward to seeing how he fares on a slow track - "he is an interesting runner." A game last start fourth at Flemington, Extra Noble strips all the fitter third up and Moroney was pleased with that last run, noting that "he was well above himself on the day, we were worried that he was too much so but he performed very well." "He has been waiting for these sort of conditions and he should prove hard to toss." Wednesday is a busier day for us with three runners, the first of those being Percivall Pott who lines up in the 1700m maiden with Damian Lane to ride. A fast finishing second over a similar trip at just his second start, the Sir Percy three-year-old has improved again since and there is an air of confidence about him. 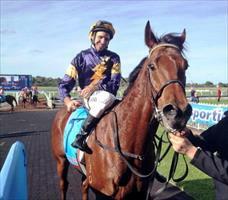 "He is starting to shape like a nice staying type," Moroney said. "If he handles the wet track he should prove hard to beat." One of the Warrnambool features is the prestigious Wangoom Handicap, a Listed $150,000 event in which we will be cheering home Yesterday's Songs. "He has been disappointing of late," Moroney admitted, but we have brought him back in distance and put the blinkers on and if the real Yesterday's Songs turns up he'd be a top chance." "He has a few foot issues so we think the give in the ground is going to suit him." We are hoping that Nordic Duke can gain a run as emergency in the 1700m handicap later in the day, seven-year-old below his best of late but just wanting a real wet track which he looks like getting this time. "We are expecting a quick turnaround on his recent form now that he is going to strike his preferred going," said Moroney. The Warrnambool Cup is a race we have enjoyed success with and hopefully Black Tomahawk can run a bold race on the back of his encouraging second up performance at Caulfield. "He went really well there and he is suited by another step up in distance. So long as it is not too heavy we are expecting him to run a great race."